The ghosts of yesteryear journey through my mind. The white frame house stood sixty feet back from the road. It was the first frame house built in Birtle. It was a white clapboard structure with black shingles. A bay window at the front had a tin roof on which rain drummed during storms. The windows were old-fashioned wooden storms with air holes at the bottom in winter and screens only in summer. Two round pails of red geraniums stood on round cement blocks on either side of the front stoop. In another corner of the front house, more red geraniums stretched out of white wooden window boxes. Around the corner, blue morning glories crept up the side of the back porch and opened their faces to the sun. Along the east side of the porch, Virginia creepers entwined across the side and sheltered the occupants of the house from the curious people who came to view the historic spring and to pump a pail of water to make a good cuppa tea. Caragana hedges marched around three-quarters of the way around the yard, acting as another shield. Mom’s gardens could be glimpsed through the gaps in the hedge. Orange speckled tiger lilies and blue delphiniums vied for space in the side gardens along with Sweet Williams, Marigolds and ferny Marguerites at their feet. Mauve Sweet Rockets snuck in wherever they could find space. Two more rows of caraganas marched down the middle of the gravel walkway dividing the front lawn. White clover, purple dog-toothed violets, and Creeping Charlie hide in the grass. A large stone about a foot wide is embedded deep in the ground. This served as home plate when the girls played baseball. A pair of white sailboats mounted on a merry-go-round on top of a white pole whirled in the summer breezes. The ruins of a cook stove were mounted on a box by the back hedge. This was part of the girls’ playhouse where they made sand tarts and cooked mud pies. A quick trip to the rhubarb patch resulted in leafy umbrellas to offer shade. Now the house is torn down, smashed by the arm of a digging machine until it crumbled like a box of matchsticks. Only dust remained. The maples have been demolished by a zealous town worker acting without permission. The wire fence has been ripped out and replaced by a single picket fence across the front. Tall weeds choke out the lawn which is trying to grow. Brave Johnny jumps up poke their heads up and try to offer cheer. Only ghosts and the memories remain. 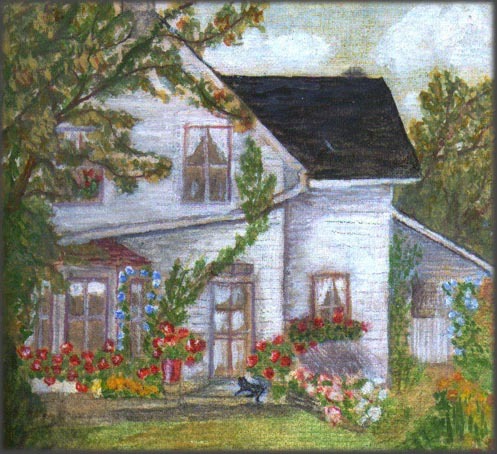 *Note: The picture of the house was painted by the late Maureen Henry about 1967. It was given to the author for her twenty-first birthday. The painting has occupied a place of honour in every home the author has lived for fifty years.